That is the conclusion of a novel assessment of the simulated effects of implementing a conservation dairy-farming system on all dairy farms in the Spring Creek watershed, a small drainage in Centre County. In the simulations, the conservation dairy-farming systems — which have been developed and tested by Penn State researchers over the last decade — produce the majority of the feed and forage crops consumed by their cattle, use no-till planting, have continuous diversified plant cover, and have one system to employ manure injection. Using a variation of the Soil and Water Assessment Tool — known as SWAT — which was customized and calibrated for the karst topography and hydrology in the Spring Creek watershed in earlier Penn State research, researchers modeled nutrient and sediment-loading processes of four dairy-farming scenarios that differed in land area, feed-production and nutrient-input strategies. 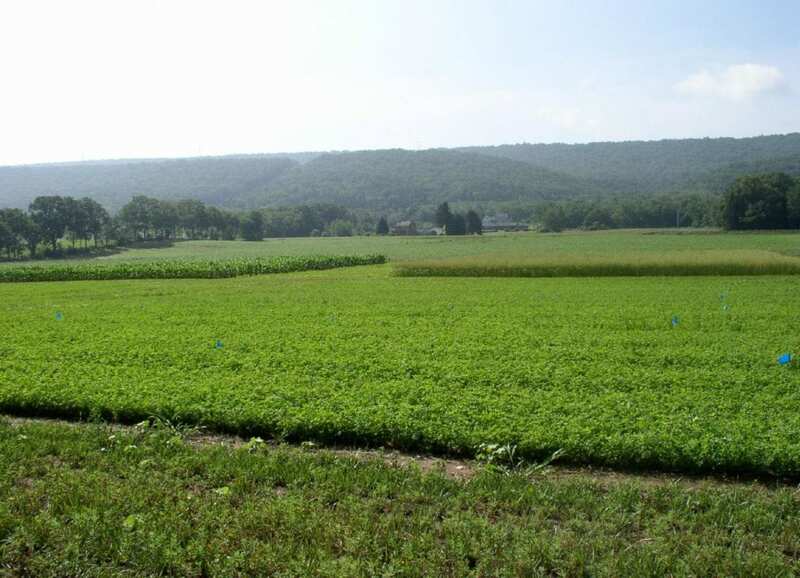 They compared nonpoint pollution generated by "typical" existing Pennsylvania dairy farms that include some no-till and limited cover cropping, with dairy farms under conservation management. Compared to the "typical" Pennsylvania dairy farm that employs some best management practices, produces all the herd's forage, and purchases most of the cattle feed grain, the enhanced conservation dairy-cropping scenarios improved water quality by achieving significant pollution reductions. Over the 12-year SWAT simulation, they cut the number of in-stream peaks of nutrients and sediment and reduced average concentration of sediment by 31 percent, organic nitrogen by 41 to 53 percent, nitrate by 23 percent, organic phosphorus by 36-45 percent and soluble phosphorus by 32 to 43 percent. Both conservation scenarios also decreased nitrous oxide emissions by reducing denitrification, but the scenario that included manure injection retarded 91 percent of the nitrogen volatilization that occurred in the broadcast-manure scenario. "They have twice as much land and are growing all of their feed and forage, which helps them be profitable, because feed costs account for at least 50 percent of milk-production costs," she said. "And, perhaps most important, they are not applying manure to the same land as often because they have more land to spread it on. In addition, when the conservation farms apply manure in fall, they apply it to winter annual crops that are either cover crops, that retain some of the nutrients, or silage crops, that utilize more of the fall-applied manure to produce forage crops." Of course, achieving such large-scale adoption of conservation dairy-farming practices will not be simple, easy or cheap, Karsten conceded. Farmers will need access to affordable land to grow more feed for their herds and apply manure at lower rates. And, she pointed out, technical assistance and financial incentives will be needed to facilitate large-scale adoption of best-management practices such as manure injection, winter annual silage production and cover cropping. "Using SWAT to simulate and compare four farming systems over 12 years at the watershed scale enabled the team to assess the impact of large-scale implementation of the dairy-farming scenarios," Amin said. "We learned that the conservation dairy-farming scenarios can reduce nutrient and sediment losses from agricultural lands and help achieve targeted total maximum daily loads into the Chesapeake Bay." Also involved in the research, published in the September issue of Agricultural Systems, were Douglas Beegle, distinguished professor of agronomy, Penn State and Peter Kleinman and Tamie Veith, both with the U.S. Department of Agriculture's Pasture Systems and Watershed Management Research Unit. The U.S. Environmental Protection Agency, the U.S. Department of Agriculture Pasture Systems and Watershed Management Research Unit, and the Center for Nutrient Solutions at Penn State supported this research.